The 2018 Ford Edge is a mid-size, two-row SUV that has the space and the features to make all your drives pleasant and enjoyable. A spacious sport utility vehicle, the Ford Edge has comfortable seating for five people, plus a generous 39.2 cubic feet (1.1 cubic metres) of storage space behind the second row. That’s lots of room for hauling supplies back from the home center, or for carrying all your vacation gear. There’s an available hands-free tailgate for easy access to everything in the back. The 2018 Ford Edge SEL Sport Appearance Package brings a stylish new look to the 2018 Ford Edge lineup. It features dark-accented exterior, plus unique 19” Magnetic-painted alloy wheels, grille, mirror caps and rear spoiler. Inside, there are Mayan Gray fabric seats with umber-colored Miko suede cloth perforated inserts, a Copper Dune textured appliqué that carries the color theme to the dash, and custom embroidered floor mats. 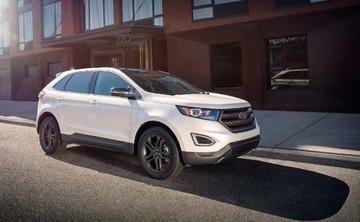 In addition, the 2018 Ford Edge SEL, Titanium and Sport Series get an optional Safe and Smart Package. The 2018 Ford Edge comes in four trim levels: SE, SEL, Titanium, and Sport. 2018 Ford Edge pricing starts at $33,199 for the SE with front-wheel drive and tops out at $46,499 for the Sport with all-wheel drive. The 2018 Ford Edge comes with six airbags as standard equipment: driver and front row passenger front and knee airbags, plus side-impact airbags with a rollover sensor. Several driver assistance technologies are also available on the 2018 Ford Edge. The Technology package on SEL, Titanium, and Sport models includes blind spot monitoring with rear cross-traffic alert. The Safe and Smart package is also offered on SEL, Titanium, and Sport models, and includes adaptive cruise control, forward-collision warning, automatic high-beam headlamps, and lane-keeping assist. The 2018 Ford Edge offers SYNC 3, Ford’s new, easy-to-use voice-activated technology. SYNC 3 is available on the Edge SEL model, and standard on the Titanium and Sport models. It pairs with your smartphone using Bluetooth for easy, hands-free calling. With its simple, easy to understand touchscreen, it can also control your music selections, whether from the radio, your personal music from your phone, or from phone apps like Pandora. Apple CarPlay and Android Auto are built into the 2018 Edge’s SYNC 3, so it’s ready to take advantage of your phone’s functionality. You can also control the Edge’s navigation system with voice commands through the SYNC 3 interface. On 2018 Ford Edge models, a 2.0L 245-horsepower EcoBoost turbocharged four-cylinder is standard on SE, SEL, and Titanium models, with an optional 3.5L 280-horsepower V6 available as an upgrade. The most powerful Edge powerplant comes with the Edge Sport model. It is a 2.7L 315-horsepower EcoBoost turbocharged V6 with standard all-wheel drive. All Edge engines are joined to a six-speed automatic transmission with paddle shifters. For a two-row mid-size SUV with performance, style, and technology, see the 2018 Ford Edge at Van Isle Ford in Port Alberni. Contact us for a test drive of this attractive, go-anywhere vehicle.